In order to setup the Cart to Quote for Woocommerce plugin navigate from your WordPress administration panel to “Woocommerce → Settings” and click on the Cart to Quote Tab. Always prompt for log in: Disallow access to guests and prompt for log in even in single quotes. Require account: Allow access to the plugin functionality, but require login to submit quote list. 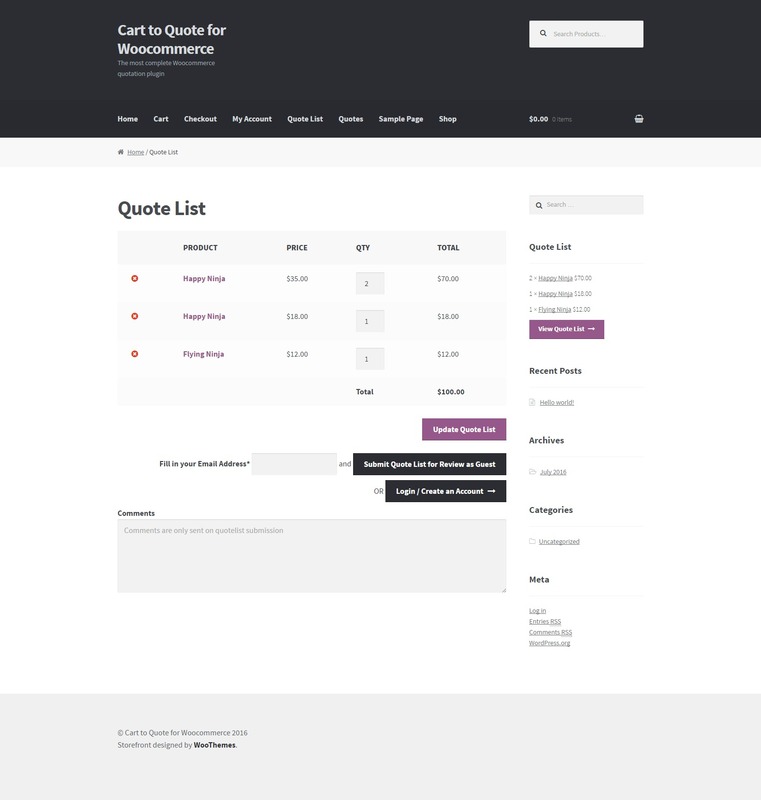 Add quotes list on my account: Add the quotes list before the orders list on Woocommerce my account page. Remove add to quote button on product: Removes the “add to quote” button on the single product page. Remove add to quote button from product archives: Removes the “add to quote” button on the product archives list/loop page. Disallow user remarks: Users will not be able to add remarks (notes) to quotes, if you check this. 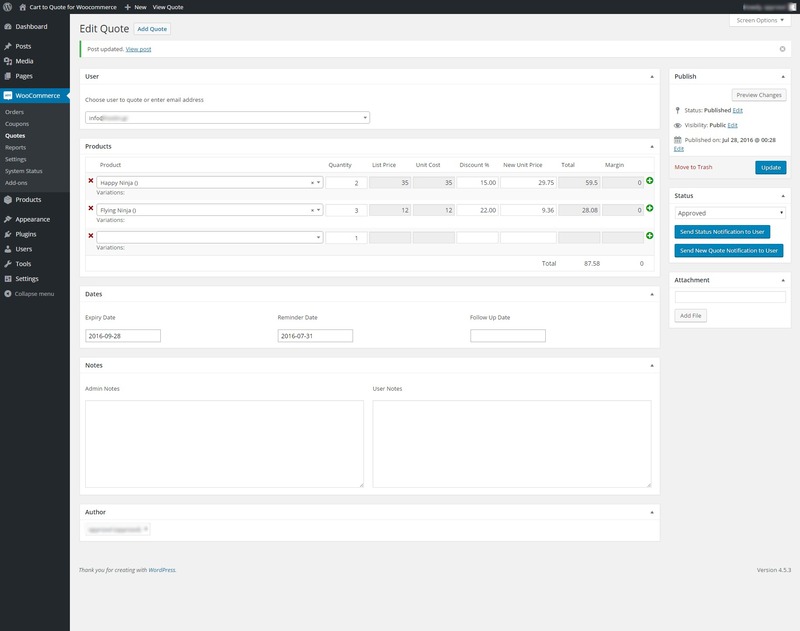 Empty cart before adding quote items: The cart will be emptied before adding quote items to it when the user accepts a quote. Days to remember user’s quote list: How many days should the plugin remember the users quote list when the user is logged out (default is 100). Basically is the cookie life. New quote email notification: Here you may insert an email address to receive new quote requests notification, eg. the shop manager email address. Email user on frontend new quote: Email quote details to the user that is submitting the new quote from the frontend. Text before the quote list on the reminder email: Here you may enter any custom text that will be inserted before the quote list on the quote reminder email that is sent to the customer. Text after the quote list on the reminder email: Here you may enter any custom text that will be inserted after the quote list on the quote reminder email that is sent to the customer. Text before the quote list on the follow up email: Here you may enter any custom text that will be inserted before the quote list on the quote follow up email that is sent to the customer. Text after the quote list on the follow up email: Here you may enter any custom text that will be inserted after the quote list on the quote follow up email that is sent to the customer. PDF Logo: Drag and drop or “Add Media” to the editor in order to customize the logo on the PDF that is sent as attachment to the customer on the quote list creation. PDF Company Address: The address of your company that you may want to display on the PDF with the quote details. PDF Text Before Product’s Table: Any text that you want to be displayed on the PDF, before the table with the list of the quoted products. PDF Page Footer: Any text that you want to be displayed on the PDF footer. PDF Headers Background Color: Any color that you would like as background in the PDF (table) headers. PDF Links Color: Any color that you would like for any links on the PDF. PDF Style: Here you may enter any CSS rules to be applied to the PDF (do NOT include ). In order to create or edit any quote navigate from your WordPress administration panel to “Woocommerce → Quotes“. The functionality is the same as any WordPress Custom Post Type. If you already have quotes created you may edit, quick edit, trash or view any quote. Just hover on the quote title for the links to show up. User: You may add a user by start typing on the User field. An AJAX search will be ran on the background for already registered users and you will be prompt to select one if anyone is found. If the user does not exist you may type his email and the select it. YOu will be prompt to fill in his/her details. It is not obligatory to add the details of the user. On the next area you may select the products you want to add to the quote or edit the existing ones. In the same way start typing the title or SKU of the product and you will be prompt to select on of the results that are found. All fields bu the quantity will be autofilled for you after you select a product. You may enter the profit margin by editing each individual product. Look for the “Unit Cost” field. To add more product click on the plus (+) sign on the end of each row. To remove a product click on the (x) sign on the start of each row. To enter an expiry, reminder and follow up date click on any of the three fields. A calendar will pop up. You may keep notes for admins only on the “Admin Notes” textarea. If the quote was submitted bya user and the user added some remarks (notes), those will be displayed on the “User Notes” textarea. On the sidebar you may select nad/or change the status of the quote. You may add an attachment to the quote by clicking on the “Add File” button. The default WordPress media manager will pop up. This attachment will be sent to the user on quote submission. If you are editing a quote then you will have two additional options. “Send status notification to user” (self explanatory). “Send New Quote Notification to USer” in case you want to resend the email that was sent to him/her when the quote was first created. Users, depending on your settings, will be able to add products in their quotes list and ask for quotes. They will be able to ask for a quote and see their quotes on the “My Account” page. You may override any of the plugin templates in the same way you do for woocommerce. Just copy the file in “your-theme-directory/c2q/”. eg. if you want to override the single-quote.php and your theme is “storefront-child” then create a folder named “c2q” in “/wp-content/themes/storefront-child/” and copy the file “single-quote.php” in there. Now you may edit it as preferred. Many hooks are in place. Please search the code for a full list. A list is also available in the documentation. Will it work with this (any not tested by us) plugin? I need this change on the plugin. Will you do it for me? If this is a change that will benefilt all buyers, we may consider it. If it is a customization, then we are sorry, but this is not included on the support. How many quotes can it handle? This really depends on the server and site optimization. How may I translate the plugin? Install Poedit and edit & save c2q.pot to your language, in the plugin's /languages directory. Watch the Cart to Quote's presentation videos.